Janet Porter knew that to get her near-total abortion ban to the U.S. Supreme Court, she first had to get passed in Ohio. As the former legislative director of Ohio Right to Life, Porter has a lengthy history within the anti-choice movement. She may not be a household name, but you’ve undoubtedly heard of her handiwork. Anti-choice activist Janet Porter has spent years pushing her “heartbeat” legislation, which would outlaw abortion as early as six weeks into pregnancy—before many even know they are pregnant. Porter’s push is again gaining momentum in the waning days of Ohio’s legislative session. Its latest iteration, HB 258, was approved by Republicans in the state house in November and passed by an 18-13 vote in the state senate last week. Though Republican Gov. John Kasich vetoed a similar measure in 2016, even if he does so again, there may be enoughvotes for lawmakers to override it. If not, the anti-choice restriction will see a friendlier ally next time around in incoming-Gov. Mike DeWine (R), who has promised to sign such legislation. Other bullet points on Porter’s resume include a failed run for the state legislature and losing her radio show with Christian broadcaster VCY America after championing “dominionism,” the belief that Christians should control all institutions, including governmental bodies, and that there should be a return to biblical law. In 2017, during the Alabama special election to replace Jeff Sessions in the U.S. Senate, Porter was one of Republican candidate Roy Moore’s most vocal defenders amid accusations of sexual misconduct with young women and girls. In November of that year, Porter convened a press conference of anti-choice extremists who remained loyal to Moore despite the allegations against him. She continued defending Moore throughout the special election and acted as a spokesperson for the campaign during appearances in media outlets like CNN. As the former legislative director of anti-choice group Ohio Right to Life (ORTL), Porter has a history within the anti-choice movement. 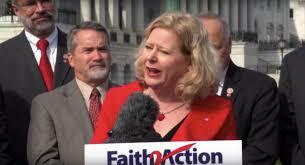 Faith2Action’s website states she worked there from 1988 to 1997 and “successfully lobbied for passage of the nation’s first Partial-Birth Abortion Ban.” So it’s no surprise that she later set her sights ending legal abortion. Though these sorts of near-total abortion bans are becoming increasingly common, they first appeared in the Ohio legislature in 2011. Porter, according to the Daily Beast, was one of the measure’s original architects. Speaking to the publication in 2013, she reminisced about how the idea for the legislation came to her during the funeral for her former boss at ORTL. “I was overwhelmed by the revelation that we don’t have much time on planet Earth,” she said in the interview. “I thought, ‘We’ve got to end this, and we need to end it now.’” During the funeral, she reportedly began to assemble a team to draft the ban. But to get it to the Supreme Court, Porter first had to get the measure through the state legislature. It’s a task Porter, who had by then founded Faith2Action, took to heart. After the bill was introduced in 2011, her organization sent red heart-shaped balloons to lawmakers to urge them to vote for it. The next month, the group brought pregnant women to a committee hearing and gave them an ultrasound in front of the group. In January 2012, Faith2Action sent children to deliver to lawmakers teddy bears that made the sound of a heartbeat when squeezed. The next month, they sent 2,000 roses to Ohio state senators on Valentine’s Day as part of what the Daily Record reported was a “weekly push” to get the lawmakers to take up the anti-choice bill after it was passed in the state house the year prior. Versions of Porter’s “heartbeat” bill would continue to be proposed and ultimately fail in the proceeding years. Porter continued to take extreme measures to get it passed. In November 2015, the group sent activists to picket the homes of state lawmakers in hopes of getting the legislation a vote. In 2016, another version, HB 493, cleared the legislature. Porter attributed “divine intervention” to its passage, but the measure was vetoed by the governor. Though King’s measure never got a vote in the GOP-held House, it did get the support of 173 co-sponsors. And later that year, Porter joined former-U.S. House of Representatives Majority Leader Tom DeLay at the White House to lobby for the total abortion ban. Now, another version of the ban in Ohio is again awaiting Kasich’s signature or veto. And Porter isn’t staying quiet about how she hopes it will end. “The bill itself is one that we believe the Supreme Court is ready for,” she told NBC News last week. Porter did not respond to an interview request from Rewire.News. Well, sombody’s la creepa. I think Chuck’s done all the things he wants Janet to do, and that’s great. But, out of either malice or ignorance, he wants to keep it legal to have other people murdered. In God’s eyes, that erases all the good Chuck’s done. I know, He told me.